Messaging apps help your small business’ team to communicate and collaborate and they can also be used more casually to help them bond while they get to know each other more personally. We looked at the most popular options and reviewed Slack, HipChat, and Skype for Business in-depth below. 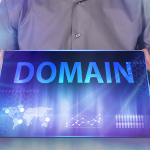 These solutions covered a range for small businesses in terms of price and features. Read on for our comparison and review of these three options, as well as our top recommendations. We recommend Slack as the best messaging app for small businesses in 2017 because of its combination of features, user interface, and widespread use. On paper, HipChat and Skype for Business offer a lower price and added features than Slack. So why did we choose Slack as the best messaging app for small businesses for 2017? Because a tool is only useful if people adopt it, and Slack’s polished user interface, customizable settings that integrate it with your personal workflow, and widespread use make it more likely that your team will use it more often. Slack also offers a seemingly endless number of integrations with other third-party apps to help you extend and customize its functions even further. There are options for your communications, project management, development, marketing teams — and almost any other you can think of. Using these integrations, you can send and receive notifications to and from project-specific channels in Slack to your other productivity tools of choice. For example, if you use Trello to help manage your projects, you can create a new card by typing a specific command into your chat window. 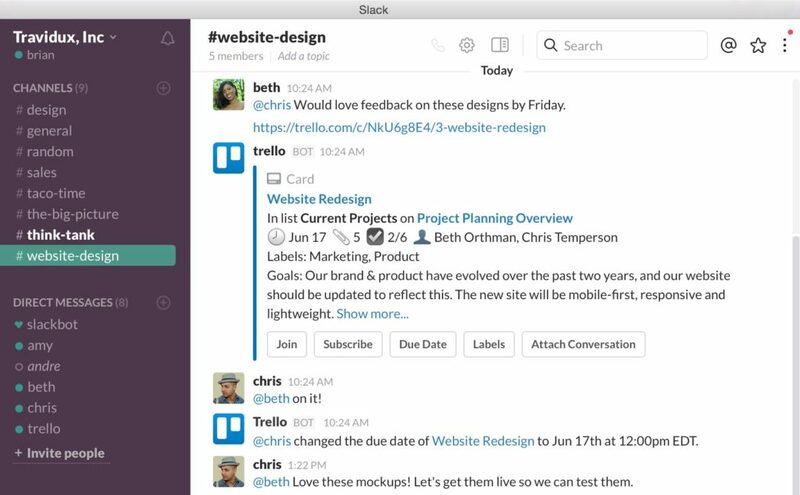 Similarly, you can link to existing Trello cards, make updates, and receive notifications in Slack when an update is made in Trello. HipChat’s primary benefit is that it offers an almost identical set of standard features, but for approximately ⅓ of the price ($2/month per user for HipChat vs. $6.67/month per user for slack). HipChat doesn’t offer much to differentiate it from Slack other than its lower price, with the exception of unlimited cloud storage versus 10GB per user for Slack. Its standard features are almost identical and they’re wrapped in a less attractive user interface. While this may not seem like a significant difference, it’s because of that user interface that your employees are more likely to widely adopt Slack — not just for chatting, but for how seamlessly it integrates with other third-party apps that your business uses every day. 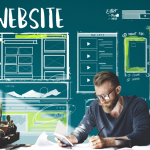 That said, it will be an attractive alternative for businesses that don’t want to sacrifice features for cost and are willing to forego a more fully realized user experience for the lower price. The $5/month per user price package for Skype for Business that we reviewed also includes a subscription to Office 365 Business Essentials for each user. 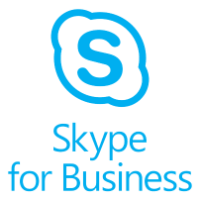 However, if your business subscribes to the Office 365 Business Premium package for $12.50/month per user, then Skype for Business is already included in your cost. The main difference between the two packages is that the Business Essentials tier is cloud-based so you need to be connected to the internet to use it, but the Business Premium tier includes desktop versions of the software. Office 365 Business Essentials includes web-based applications like Word, Excel, and Outlook with a 50GB mailbox for each user as well as 1TB of cloud storage and collaboration tools like HD video conferencing. While we don’t find Skype’s user experience to be as intuitive or comprehensive as Slack’s, businesses that care more about the number of available features and the service’s integration with the Office 365 suite than usability should seriously consider it as an option. Both Slack and HipChat offer free versions of their app with limited features. Skype for Business, however, does not. How easy an app is to use and the ability to incorporate it into your personal workflow are the biggest barriers to its adoption, and communication and collaboration apps will only be useful if they’re adopted throughout your team. Adding members to your messaging app is the first step in your team adopting it, and the first point where Slack and HipChat differentiate themselves from Skype. With Slack and HipChat, administrators can send an invitation email to the team. Once they’ve signed up for the app, they’re automatically added to any team-wide channels and can join newly created ones. When a user is a member of a channel, they remain there until they leave. This organizes and centralizes conversation. Skype, however, requires users to sign up on their own, add each team member to their personal contact list, and then conversations are treated as one-offs — that is, every time you chat with someone, a new chat starts and other users who aren’t invited to it don’t have access to it. For project-related discussions, this risks users being excluded and/or missing important information from previous discussions. It’s easy to perform basic most basic functions, such as sending messages to and from other users, using Slack, HipChat, and Skype for Business, but to truly maximize their effectiveness you need to dig deeper and customize the apps to your needs. Configuring notifications, adding third-party integrations, and incorporating the apps into your workflow are when they begin to realize their potential and improve your productivity. Slack: Part of what makes Slack such an effective tool is what also gives it a bit of a learning curve. Basic tasks, like sending and receiving messages, are easy but customizing settings, configurations, and exploring app integrations to incorporate it into your personal workflow can take a little time. And if your business is adopting Slack for the first time, your team’s particular rules of engagement will likely need some time to evolve organically. Finally, Slackbot offers tips as you use the service — it intelligently detects the tasks you’re performing and makes suggestions on how you can take advantage of the app’s many features to do them more efficiently. 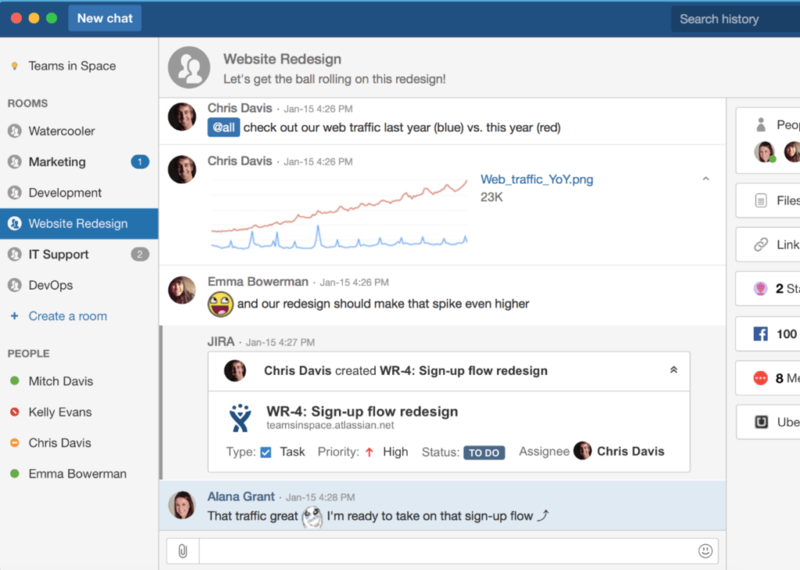 HipChat: Hipchat’s interface and organization is very similar to Slack’s, only not quite as polished. The app’s rooms are analogous to Slack’s channels, which organize conversations by topic. Within each room, users can chat, share files, and flag individual users by using the @ symbol and their name. Adding integrations from many third-party apps (although not as many as Slack), or connecting to other apps via Zapier, gives users the power to incorporate HipChat with the other apps they use throughout their day. Like Slack, basic functions are very easy to perform but users will need to spend some time configuring their options and adding third-party app integrations to customize HipChat to their needs and maximize its usefulness. Skype for Business: Skype for Business will be familiar to anyone who has used their free consumer-focused product, Skype (albeit with an inverted color scheme). 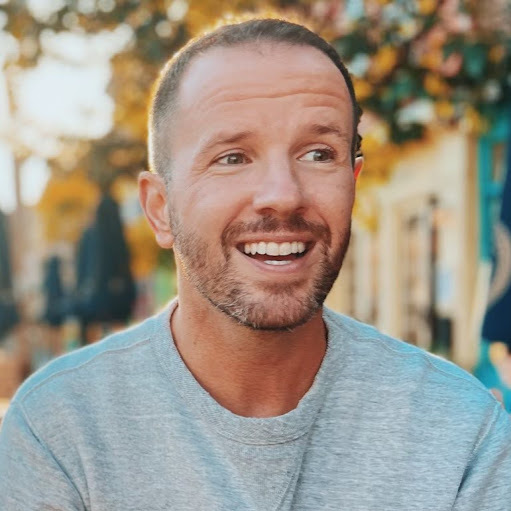 The user interface is clean and easy to navigate and feels more like a traditional chat app than an audio and video app, which is what it’s better known for — even though these functions are just as accessible as the chat. Slack and HipChat are very similarly featured apps; where they significantly differ is in their user interface, user experience, and price. Skype for Business, however, offers more. Slack: One of its more enjoyable features is that it functions as more of a “pull” app than a “push” one — that is, rather than being notified of every new message, you can customize the types of notifications you receive and for which actions. This lets you scale your notifications back so that the onus is on you to check the app when you reach a logical break in your work. 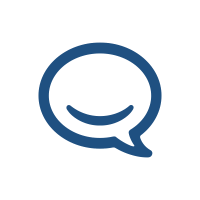 Messages in a conversation are archived and you can backread when you set aside the time to. This is in contrast to tools like email where a new email notification often imbues you with a sense of obligation to interrupt what you’re working on to check it and reply. If another team member needs you urgently or directs a message to you specifically, they can either send you a private direct message or use the @ symbol and your name to flag you in their message. Keyword alerts, muting specific channels, and setting up do not disturb times where you don’t receive any notifications at all are more steps you can take to customize Slack to your specific needs. 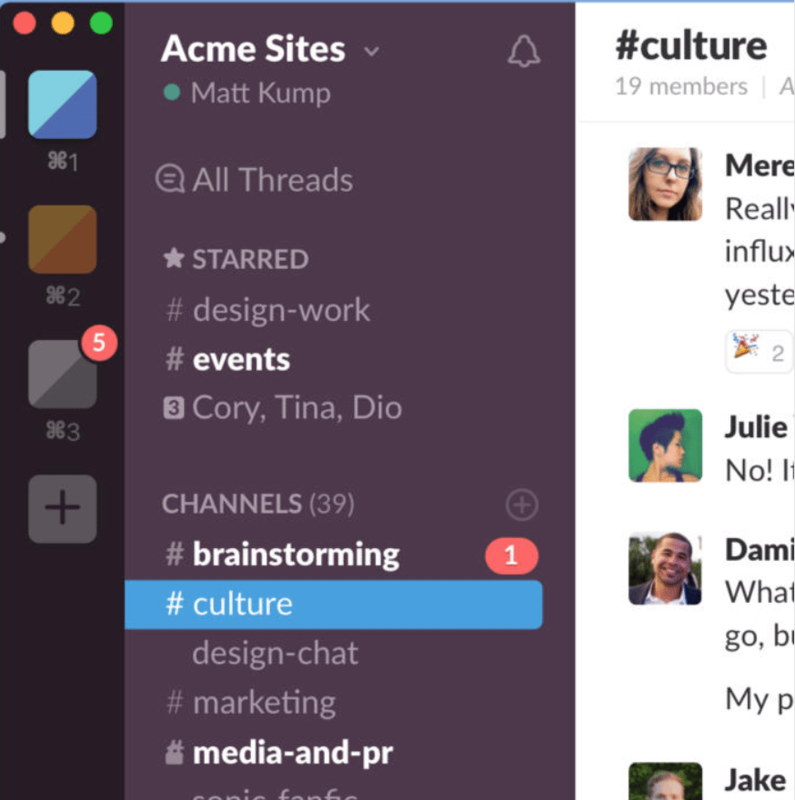 Slack also offers other features to help your business day-to-day, such as group audio and video calls. While not as full-featured as dedicated video conferencing software, it’s adequate for one-on-one conversations or impromptu breakout meetings. 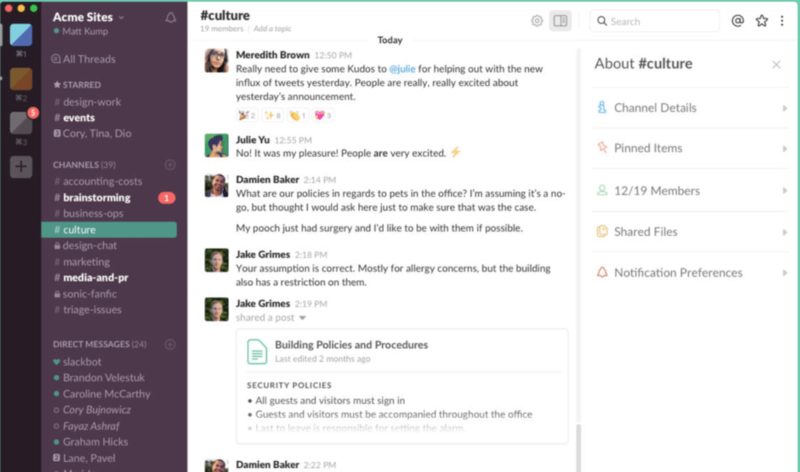 Slack’s core features are very similar to HipChat’s and Skype for Business’. Where Slack excels is in how it organizes and presents them in a polished and aesthetically pleasing user interface that delivers the best user experience of the three services. And when adoption throughout your team is the biggest barrier to an app’s success, this experience will ensure that more people do. HipChat: HipChat doesn’t offer much to differentiate it from Slack other than its lower price. Its standard features are almost identical and they’re wrapped in a less attractive user interface. That said, at approximately ⅓ of the price of Slack, it’s an attractive alternative for businesses that don’t want to sacrifice features for cost and are willing to forego some user experience for the lower price. Skype for Business: Skype for Business’ primary differentiating feature isn’t built into the messaging app at all. Rather, it’s what else is included for each paid user — Office 365 Business Essentials. Your subscription to Office 365 Business Essentials includes access to the web-based versions of industry-leading productivity applications like Word, Excel, Powerpoint, and Outlook. 50GB of storage per Outlook mailbox and 1TB of cloud storage are also included. 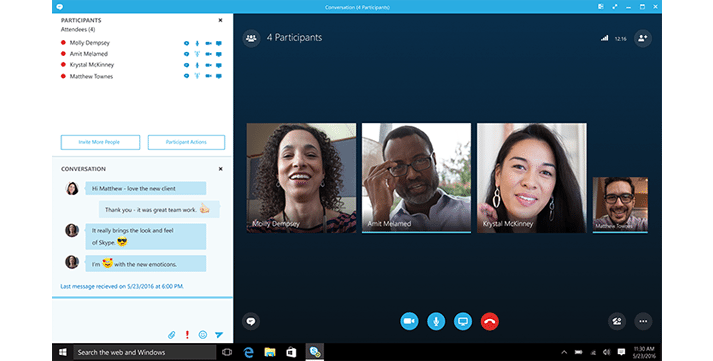 Skype for Business also offers the most fully realized audio and video conferencing features, owing, of course, to its pedigree as a conferencing app. HD video, call recording, screen sharing and control, and whiteboarding all come standard. This added value will be of particular use to businesses who are looking for an all-in-one subscription and who are willing to sacrifice Slack’s user experience for the additional apps at a lower cost. Where they differ, though, is in the phone support that they offer. Skype for Business is the only service of the three to offer phone support, and it’s available 24/7. On paper, Skype for Business offers the most features and HipChat is the lowest priced. However, Slack’s attractive user interface, comprehensive features, and extensive configuration and customization options make it more likely to be adopted by more of your team. And for a communication and collaboration app, its adoption rate is the most important factor behind it helping your team to work more efficiently and productively. Slack’s overall user experience makes it our recommended best messaging app for small businesses in 2017. I would not choose any of these because I have the ultimate messaging tool – Brosix. We use it to secure our internal communication and to facilitate the whole staff with it. It works perfectly fine for us and I recommend it. Thanks for the recommendation. We will consider it for future updates. I personally use Business messenger in my office – but is none of the 3 options. I decided to read more about them and well , I was not impressed neither of the package of service,nor of the prices. In my search a lot of options caught my attention but I finally found what I was looking for – IM, reasonable price,a lot of features and can send as many and as big files and folders I can want to my colleagues. It is Brosix. If you would like to , of course, you can find out more about it. So far I have never found an IM app that could cover all my needs. Thanks for the suggestion. Good to hear you found a solution that works for your business. Other tools which you can add in the above list are webex, R-HUB web conferencing servers, gomeetnow, gotomeeting etc. They work well. Thanks for the suggestions, Prasanta!